What Does It Cost to Completely Turn Around A Rough Neighborhood? Harris Rosen was born in a tough neighborhood of Manhattan in 1939. Through personal grit and lots of hard work, he made it to Cornell University, where he attended the School of Hotel Administration. Now he’s the owner of seven resort hotels in and around Orlando. But if you ask Rosen what his proudest achievement in life is, he won’t tell you its his success as a businessman and hotel mogul. 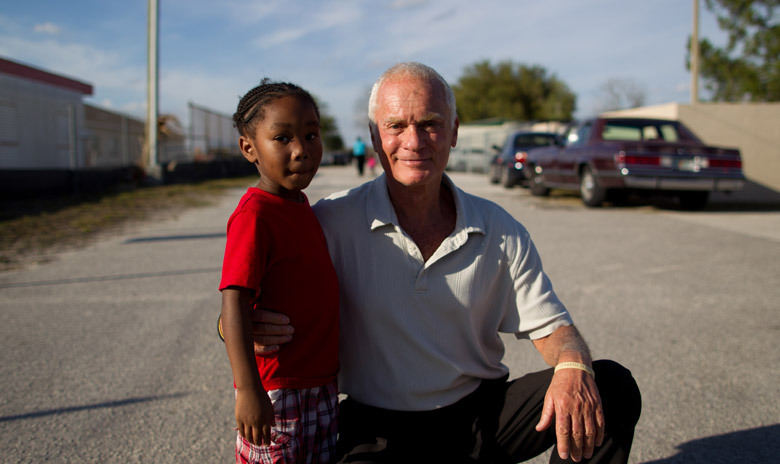 Rather, he’ll tell you the story of a small neighborhood in Orlando called Tangelo Park. Rosen first visited the neighborhood a little over 20 years ago. It was rundown and drug-infested, with a graduation rate of only 25% at the local high school. In 1993, Rosen “adopted” the neighborhood and started the Tangelo Park Program. The first thing he did was to provide free preschool to every child between the ages of 2 and 4, while simultaneously offering free parenting classes, vocational courses and technical training to the parents. Then, when those children reached high school, Rosen created a scholarship fund that pays full tuition to any state college in Florida. But he didn’t just offer it to the best students- he offered it to anyone who graduated and wanted to attend college. And he even took it a step further, covering all living and educational expenses through graduation. Of those students who have received a Rosen Scholarhsip, 77% have graduated college- that is the single highest rate among an ethnic group in the entire country. The best part: the Rosen Scholarship is now becoming more of a safety net than anything. Scores have gone up so much in Tangelo Park that many high school graduates are earning full academic scholarships on their own. Donna Wilcox was one of the early recipients of the scholarship. She used it to earn her bachelor’s degree from UCF, and then went on to get a Master’s in mass communications from the University of Georgia. The ripple effect Wilcox describes is clearly evident when you look at the numbers. The graduation rate at the high school is now nearly 100%, crime has been cut in half, and properties values in the neighborhood have skyrocketed, some even quadrupling in value since the program started in 1993. The total cost to Rosen: about $10 million. A small sum for a man who was worth upwards of $100 million back when he started the program in ’93. And when you consider that Tangelo Park has about 3,000 residents, the cost per person was less than $3,400 (spread out over 20 years, that’s only $170 per person per year). Think about that for a second. $3,400 per person increased the high school graduation rate from 25% to 100%. It paid for the college degrees of more than 200 hundred young men and women. It cut the crime rate in half. It raised property values exponentially. To learn more about the Tangelo Park Program and see its amazing results, you can visit the program’s website here.